Sony S SGPT114GB tablet review - Sony S SGPT114GB is a 9.4-inch Android tablet with 1.0 GHz NVIDIA® Tegra 2 Processor, 1GB RAM and plenty of useful features and high end specs. 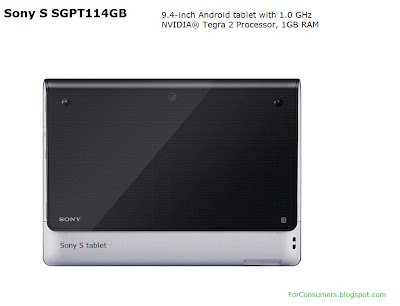 Looks - Sony S SGPT114GB looks like no other tablet on the market today. Most manufacturers are looking for the iPad effect but Sony like always decided to stand out from the crowd and use different approach for their multimedia Android tablets. Sony S tablets are designed to ergonomically fit your hand and shift its weight closer to your palm, making it feel lighter and more comfortable while reading and watching on the move. Its unique design also provides a more natural angle for typing and browsing while sitting down. Hardware - the 9.4-inch multi-touch LED display has a native resolution of 1280 x 800 and is bright enough for viewing in direct sunlight. The colors are nice and vibrant, it is quite a good display. 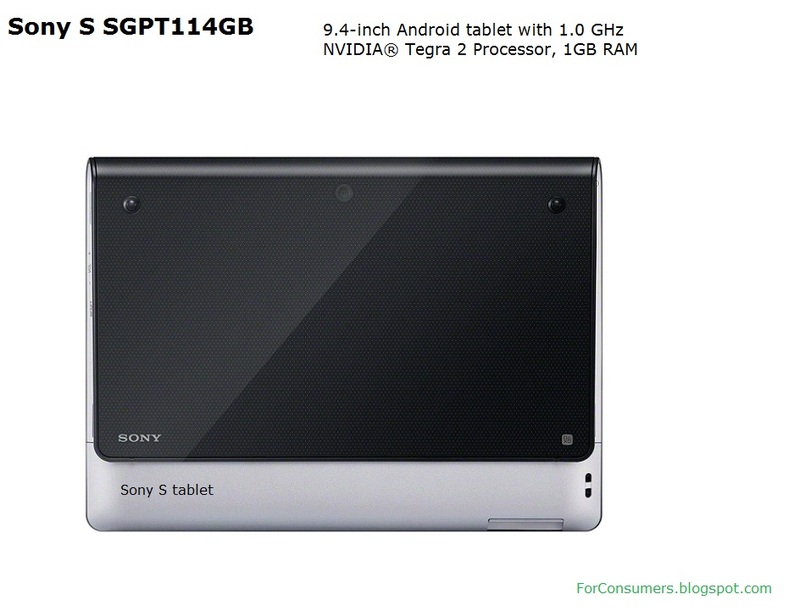 The hardware performance of the Sony S SGPT114GB tablet is provided by the 1.0 GHz NVIDIA® Tegra 2 mobile processor which isn't the latest technology on the market but it will do the job just fine for most users. With 1GB of RAM and 16GB flash memory for storage this tablet is one of the well equipped Android tablets. Connectivity options - you can rely on plenty of different options when talking about connections with the Sony S SGPT114GB. The tablet of course has IEEE 802.11b/g/n WiFi connection with 72 Mbps max. data rate. Bluetooth (2.1 + EDR) and GPS are also on board, so connecting with other devices or using the tablet as a navigation devices is quite easy. 3G connection is also available. Interfaces - USB 2.0, headphone jack and SD/SDHC are all included in the SGPT114GB tablet. There are couple of useful sensors built in the Sony S SGPT114GB tablet. These include accelerometer (3-axis), digital compass, gyro and ambient light sensor. IR function is also included so you can easily use the tablet as a remote control. Multimedia - Sony S SGPT114GB has almost any multimedia feature that you may need on the go. The 0.3M pixels VGA front and 5M pixels HD rear cameras (with mic) let you make video calls and take amazing quality pictures and videos. Multimedia playback on this device is a real pleasure with the bright 9.4-inch display and the built-in stereo speakers. The Lithium ion battery is strong and will hold charge up to 8 hours. The battery charging time is about 5 hours. 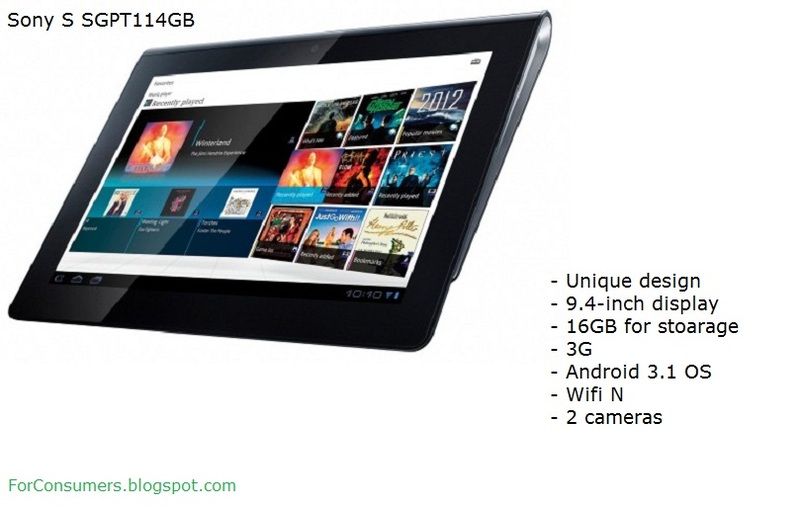 Operating system - most Sony S tablets use the 3.1 Android Honeycomb OS. The price - Sony S SGPT114GB is not exactly a cheap tablet but it is quite well equipped and the average price of £350 is just OK. As you are probably know there are plenty of competitors in this segment and it will be very hard for Sony S tablets to match the price and quality of Samsung, Asus and Apple tablets. Features Camera Webcam. 3 mp front facing. 5mp rear.